A look ahead to 2019: Where can you impact health literacy? The December edition of In the Know: Health literacy news and best practices now available. To help ring in the new year, this issue highlights simple ways that you and your organization can promote health literacy in 2019. It also provides a recap of the many events and initiatives the Partnership hosted this past year – all of which wouldn’t be possible without your support! Click here or on the icon below to access this latest edition! 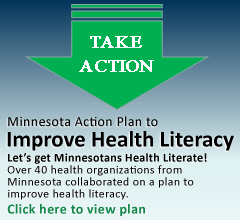 People of all ages, races, incomes, and education levels are affected by limited health literacy.